Oh, I knew the second my eyes beheld this beauty that she belonged in my sewing studio. 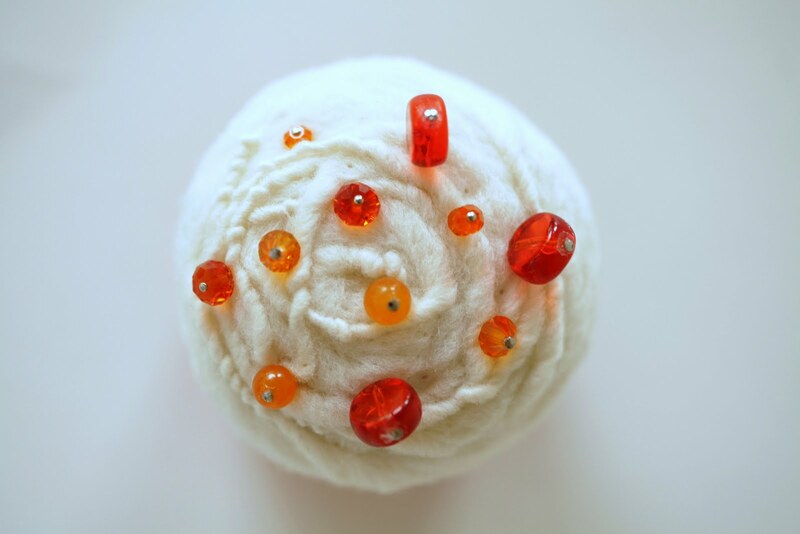 I had a perfectly functioning pincushion before, but this one, oh she just radiates, don't you think? I found her at the Etsy shop: Made in Lowell, by Liz Smith. 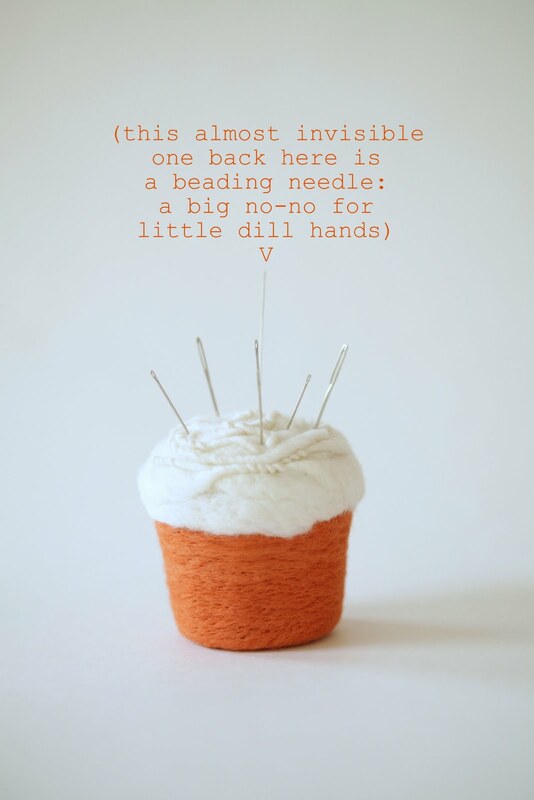 and use it for your needles instead of pins, which is what I'll be using mine for. I am too lazy to put them back in their little packages, so they go here for easy access when doing hand stitching. And with projects in full swing, I have little hands who are starting to use needles and they know where they can find them and [sometimes, hopefully] put them back. I love when function and form have a perfectly balanced, harmonious relationship. You can find Liz's full line of goods at her Etsy shop or more about her work on her blog. 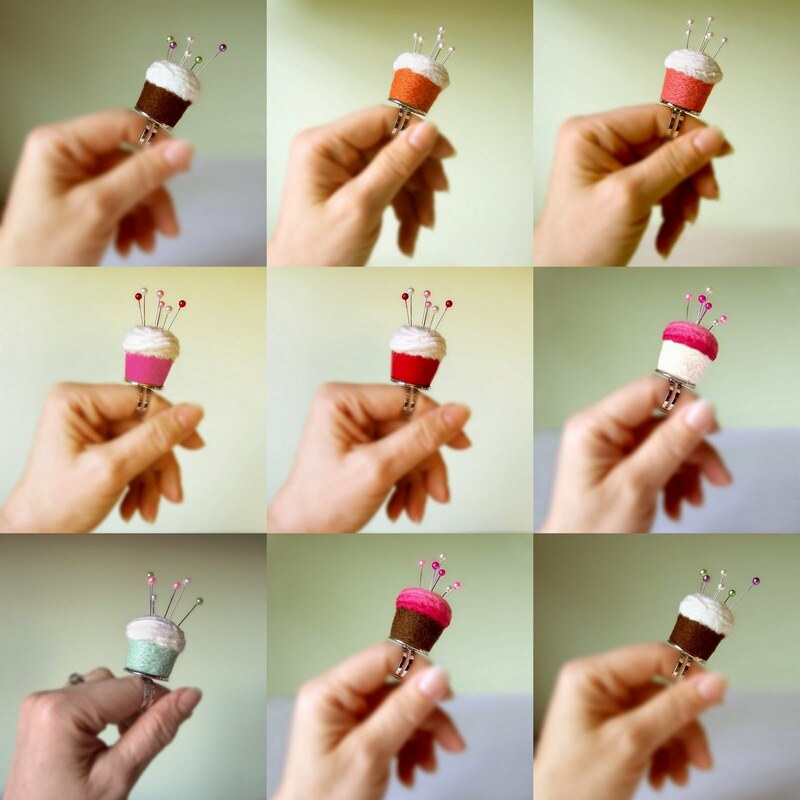 Liz is giving a no big dill reader one of these adorable pincushion rings! Visit her little bakery and leave me a comment of what flavor you'd like to sample. If your email address isn't attached to your profile, please include that as well. Open until the 4th of JULY! 11:59 EST. I'd love to sample the pumpkin of course. These are the cutest things!!! Chocolate strawberry looks delish! How cute. Since I love pink the way you do orange my favorite is strawberry. I would love the strawberry and vanilla. I love the Melon Creme and the Rust and Moss. They all look so delicious though. 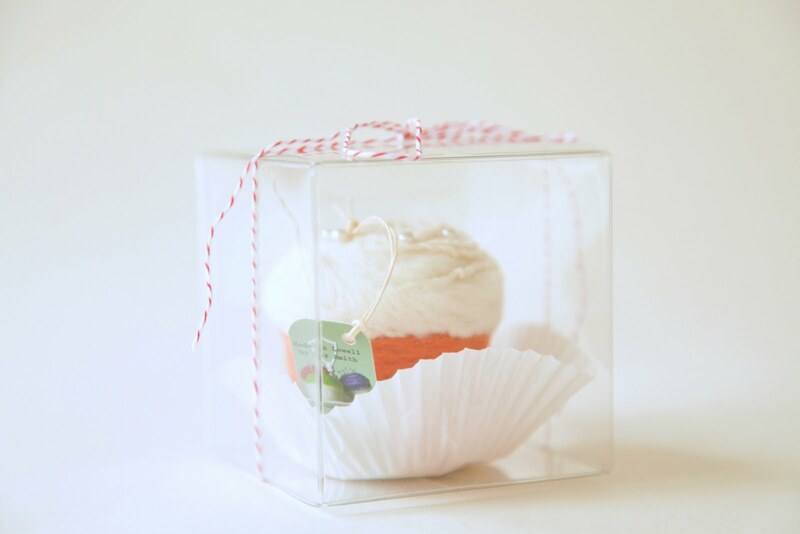 The strawberry vanilla would make the perfect gift for my dear cupcake loving friend! So cute! Adorable! I love them :) How about the Melon Creme one? It's my favorite! These are just too stinkin' cute! I love them all, but I guess my fave is the vanilla mint. Yummo! Oh, these are adorable! I would love the red velvet or the vanilla mint! I love the pumpkin vanilla. I love them all but the strawberry vanilla stole my heart! I go for classics... chocolate and vanilla, naturally! I must say, the vanilla mint looks the most delicious to me! chocolate is always my favourite flavour !! I love the vanilla mint! I'm a chocoholic, so chocolate and strawberry would be my choice! 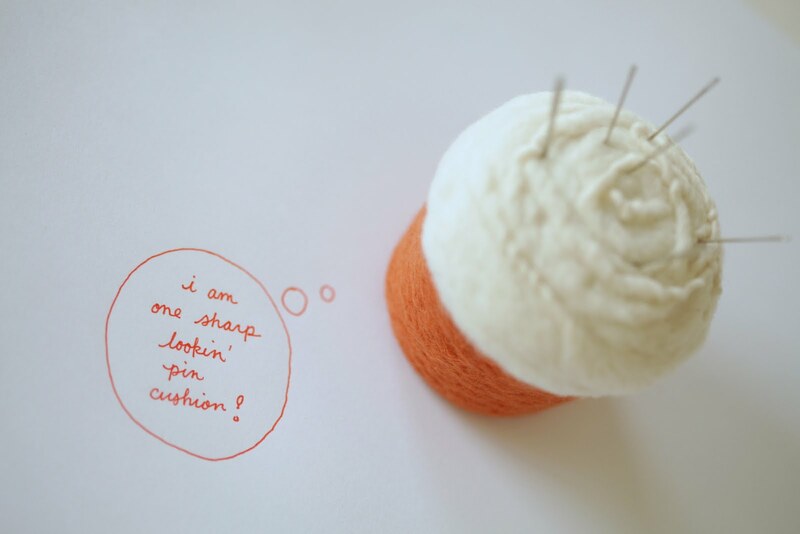 How creative are those cute pincushions?! I'd love to sample Strawberry Vanilla! Oo! I think I'd like chocolate with a strawberry swirl, please. These are so adorable! Melon Creme! Seriously, I am just going to buy some for Christmas presents, how adorable and unique! Well I really like the rust and moss pin cushion though it wouldn't match my sewing room. So I'd choose the Vanilla Mint...the ring pincushion looks interesting and I wonder if I might use that more than the larger size! OH for sure the Chocolate Vanilla!!! yay!! The chocolate strawberry looks too yummy! These are really fantastic! How cute. I just picked fabric for my first bigger-than-a-baby-blanket quilt to prepare for the big bed change this summer (we have to make room in the crib for another little one due right after you), so I have a lot of pinning coming up in my future. I think I like the Melon one best. Or Mint. Or Pumpkin? My life has no color system whatsoever, so any of them would look fantastic in my sewing box! these are SO freakin' cute! 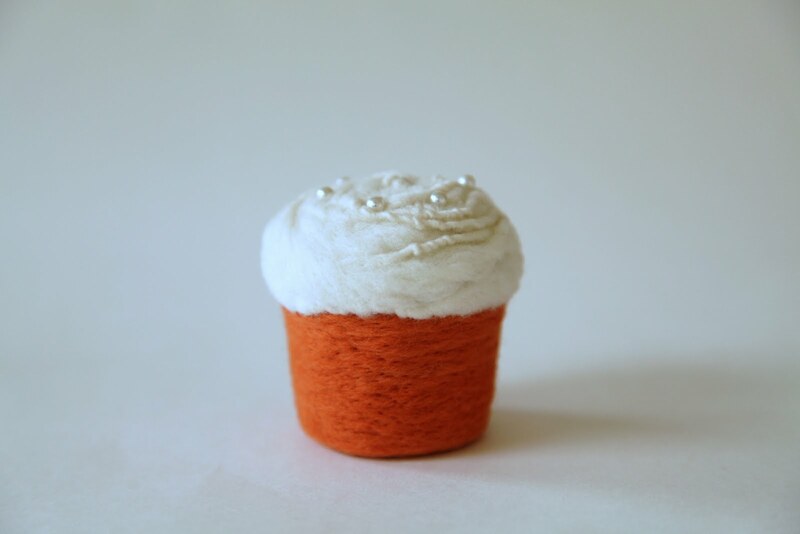 I have a pincushion ring that I'm rather fond of, but I'm thinking that I totally love the little red velvet one and might just need it, too! Thanks for hosting the giveaway! I love that pumpkin vanilla one! Too cute! Strawberry Vanilla sounds tasty to me! The chocolate and STrawberry swirl is incredible! They're all adorable, but I really like the Vanilla Mint flavor! So cute; and such a necessity :o) I think I 'must have' the melon creme! Thanks for the chance to win!!! Red velvet is calling to me! I know what I will get for my sewing friends as gifts now - thank you for the introduction. Ooh, I usually go for pumkin, but I am taken with Vanilla Mint for some reason! Thanks!!! The rust and moss version is great. Mmmm! I would to sample the vanilla mint. Sooooo cute! I love the ring idea. I am partial to vanilla and chocolate. I think the Vanilla Mint looks delicious! Ooo...they all look scrumptious to me! Though, I'm partial to the melon cream, chocolate/strawberry, and vanilla/strawberry. I love these so much. Red velvet for me! ooooo..so cute! I've got my eyes on the melon creme. I took my girls to the fabric store two weeks ago. My oldest begged to buy a sewing kit. Um... those kits they sell are boring and cheaply made, I told her. Wouldn't she much rather shop and buy tools and such to put in a kit that would be her very own one of a kind. Anyway...these cupcakes would definately make the kit much sweeter! I think she would choose either the vanilla mint or the red velvet. Strawberry and Chocolate would look yummy in my sewing box! I love the strawberry and chocolate one! Strawberry vanilla is cute. I am making yoyos this summer and this would be great to hold my needle while I prep the next Yoyo. That vanilla mint looks delish! I am loving these! If I don't win I may have to get one anyways. I love the chocolate with strawberry swirl. I adore the vanilla mint ring! These are SO precious! The chocolate Strawberry is DIVINE!!! I may need to make some real cupcakes to match! These are amazing - though I think I might get hungry every time I start sewing! oh! they're so cute! and clever... I love the chocolate and strawberry swirl... All her stuff is really good though! Yum! Love the Chocolate with strawberry swirl. Thanks so much! i'd like to sample the chocolate and vanilla! love the strawberry & vanilla! i'm a sucker for anything pink!! I LOVE these! What a great idea!! I'm partial to pink, so I would absolutely love to have the Strawberry Vanilla Cupcake! These are adorable! I love the red velvet!! Oh my! So adorable it is hard to choose . . . I think Chocolate and Strawberry is my flavor. I love the strawberry vanilla! uber cute and useful! great combo! These are just adorable! Strawberry vanilla would be my pick. Oh my goodness... what confectionary wonderfullness... it's tough to decide - Pumpkin Vanilla? Vanilla Mint?? Decisions, decisions... Should I win - SURPRISE ME!! The melon creme is delicious! What a fun thing! Wow these are so cute, I would love to sample the strawberry vanilla, please. How adorable are these!! I like Vanilla and Strawberry! Absolutely without a doubt the pumpkin vanilla. NEO. Strawberry and vanilla - my favourite, aren't these the most gorgeous things you've ever seen? So cute. Thanks for the chance. I'm loving the Chocolate with Strawberry Swirl. Yummy and cute! Fun! I am dying to see your new sewing room! melon creme or vanilla pumpkin. Chocolate and vanilla for me please! Thanks for the chance to win. Oh, vanilla mint sounds so good! They're all so cute! definitely the pumpkin! Love it! These are so adorable! I love the Strawberry Vanilla one. so so fun! she just made my decision on what color to make my homemade pins- MELON! Love them, so cute. 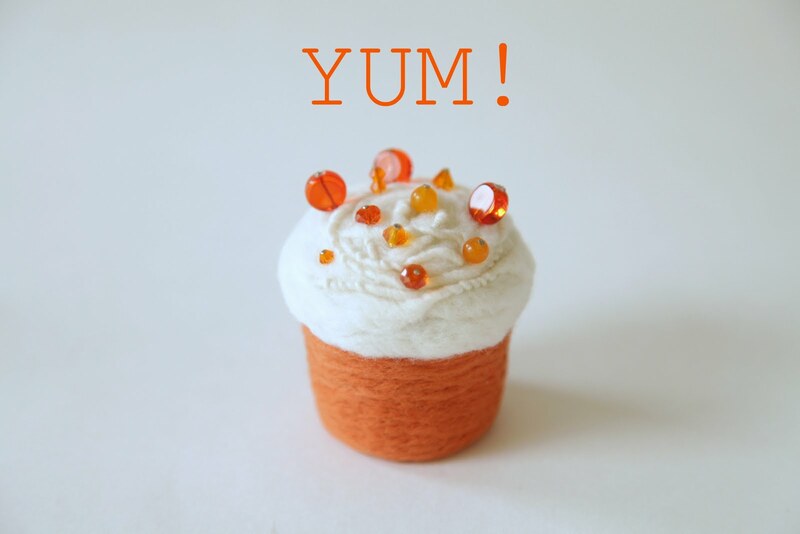 These make sewing delish! I would love the chocolate /strawberry or the red velvet one. They really are cute enough to eat! I'd LOVE to try the Vanilla Mint! Thanks for the chance to win! Strawberry and vanilla, and they are so cute, you cannot even stand the cuteness!! All look yummy..but I would have to go with the orange as well !! These are SEW cute!!! Chocolate strawberry for me, please! Vanilla and Strawberry for me!! Yum!Yum! Mmmm... the vanilla mint looks delicious! What a cute idea! I would love the red velvet. SO pretty and suddenly I'm hungry for devil's food cake! I'd love the chocolate with strawberry icing. That vanilla mint looks utterly delicious! I crave the pumpkin vanilla.... so pretty. I love the vanilla mint or strawberry swirl. They're both so cute! So perfect! I love vanilla mint. :) I don't even have a pin cushion, aggh! These are way too cute! I'd eat up the pumpkin vanilla, but this is for my wife! She'd be in heaven with the Red Velvet cupcakes! Yummm! 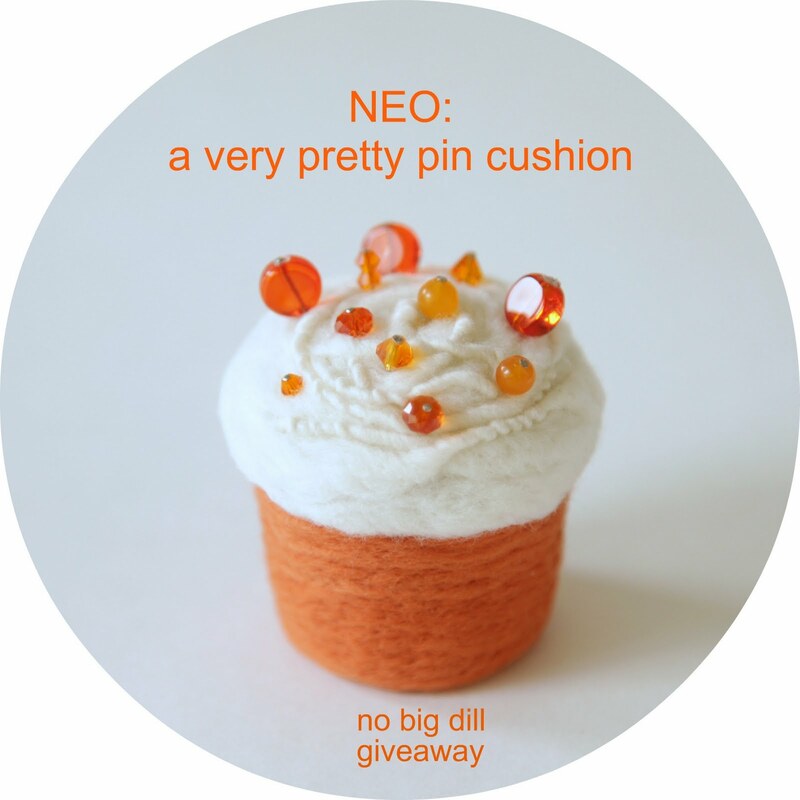 I love the melon pin cushion. Perfect for my someday craft room. I am really torn...I love the red velvet cupcake pin cushion and the red flower ring. Delicious! I love, love love the vanilla mint! I would love to sample a strawberry vanilla ring please! They all look so adorable, and I have been looking for something like this for a long time! So precious! I'm with you Katy, the orange is to die for. Oh, always the red velvet, always! So cute! I love all of them, but would have to go with the pumpkin/orange :). Adorable! I would pick the orange one you have pictured! So cute! Love the pumpkin vanilla!! How could I go past pumpkin/vanilla? Sounds like a great new taste sensation! Oh I love Liz and her work! I've been drooling over her pincushions for years! I think I'd go for the melon creme, but she used to have a cute yellow one that I was just crazy about! Chocolate with Strawberry Swirl! So pretty! Thank you! I'd go for a Red Velvet Cupcake. I hope to get lucky. Red velvet. Delicious and classy! Such cute little pincushions :) I am in love with the little blue one. These are totally adorable! I am in love! Darling! The chocolate and Strawberry one looks scruptious! I love these, they are so cute! The vanilla mint or pumpkin are my favorites! i would love to try vanilla and strawberry! super cute! I love the Pumpkin Vanilla as I am too an orange lover. Chocolate and strawberry is my favorite. Cute and functional, I love it! Choco-strawberry looks good but Pumpkin looks yummiest! I think the melon creme is the most tempting! Vanilla mint! Those are lovely!